One of the classic questions fantasy writers ask about horses is, how far can a horse travel in a day? The answer is complicated, and I hope to address it over several blog posts. The reason it’s complicated is that it depends on the individual horse and how it’s being ridden or driven. Let’s start with this question: if you are riding or driving a horse at a high rate of speed, how far can you go before the horse is too exhausted to go farther? That question has a simple answer: ten miles. Fifteen at the high end. When I say a high rate of speed, I mean a continuous fast trot or canter with perhaps some time spent at a full gallop. The pony express placed its stations ten miles apart for this reason. They rode at high rates of speed and had to change horses every ten miles. Stagecoaches, too, change their horses every ten to fifteen miles. 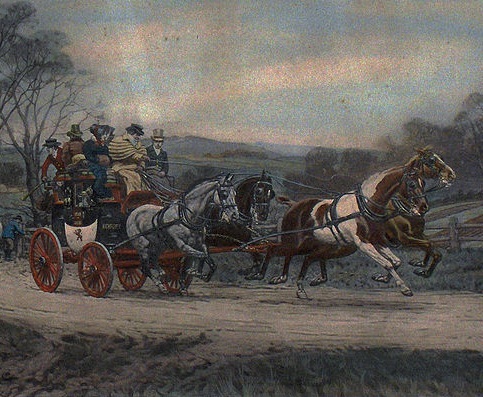 The word “stagecoach” comes from the fact that the journey is taken in stages. You go ten miles, stop at a station to change horses, go another ten, stop at a station, etc. A lot of people may not be aware of this, but when the nobility traveled during the carriage era, they did not take their own carriage horses on a long journey. They took their own horses only to the nearest post station, and then changed horses and used rented animals the rest of the way, changing every ten miles. It’s too slow if you use your own horses. If you use your own horses, you have to stop every ten miles, unhitch your horses, and rest them for two full hours. Can’t have that. This entry was posted in Fantasy, History, Horses and tagged fantasy, history, horses, travel, writing. Bookmark the permalink. Fascinating! Thanks, Amy! This will come in helpful for me. I can’t wait for more posts. I’m curious about a walking horse. Can he go all day and then the next after a good meal and a night’s rest? Thanks! I’m going to have to do some more research to finish this line of posts, because despite my horse experience, I don’t know these answers off the top of my head. You know how it is with sport horses–we work them hard for 45-60 minutes, cool them out, and put them away for the day. No opportunity to find out how far they could go if asked for more. I’m pretty sure a horse could travel at a walk all day long, with a midday lunch break, and be ready to go again the next day, because that’s pretty close to what wild horses do as they move about and graze. But I’ll find out for sure when I finish the research.